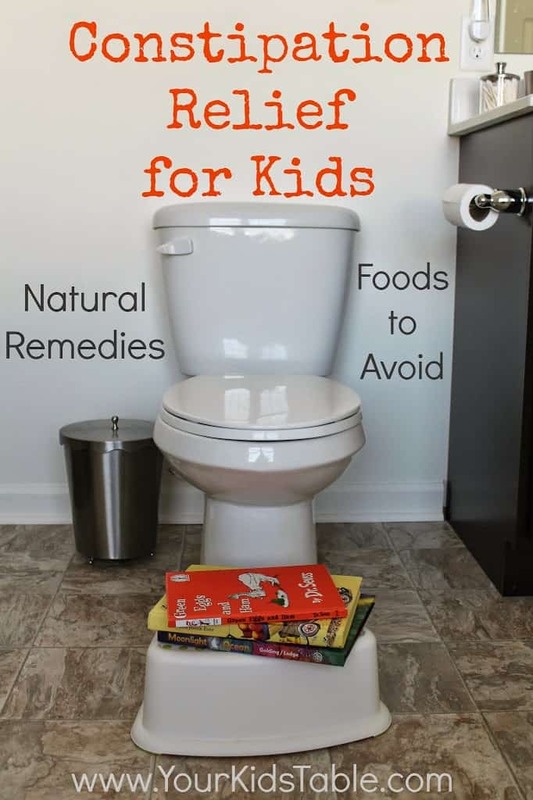 Learn natural remedies for constipation in children that work, without the help of over the counter drugs that can create years of dependence. Perfect for kids and toddlers with chronic constipation. Constipation has been an issue in my house for the last 3.5 years. It is a huge thorn in my side and frustrates me often. 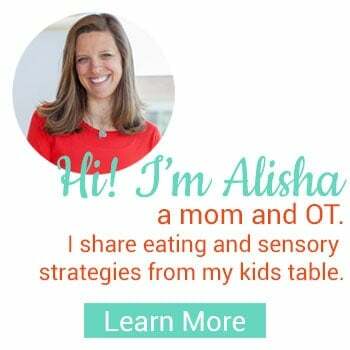 As an OT that specializes in feeding, I knew well about constipation and the effects it can have on a child’s eating habits. I know more than the basics to help with constipation, which I will share here, but in my case it wasn’t enough. I had to dig deeper. 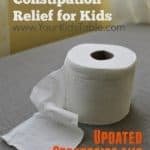 I am not a nutritionist and don’t specialize in this per say, but wanted to share the natural remedies for constipation in children that I’ve learned so it might help you. To make a long story short, Sam, who is 4.5, began to have difficulty going regularly after transitioning to cow’s milk from breast milk. At its worst, he had sharp referral pain in his back, which was frightening. At that time, we put him on Polyethylene Glycol (PEG for short, or Miralax as you likely know it) an over-the-counter stool softener. He was on it daily until about 6 months ago when I started to realize he wasn’t growing out of this. I wasn’t sure I wanted to keep him on it indefinitely and couldn’t believe that much time had passed with daily use. Although the doctors assured me that it was totally safe, after more than 2 years I decided to do some of my own research – not sure why it took me that long. I was shocked to learn that although no major incidents or side effects have been reported, it has never been approved by the FDA for use in kids or for use on a long-term basis. Miralax and I assume other stool softners are not absorbed into the body, but keep water with the bowel as it is being digested, thus freeing a child of constipation. Please know that my intent here is not to attack Miralax, for some kids it is necessary and at times it has been a miracle for us. BUT – I couldn’t help wondering, aren’t there other solutions, especially when this is a long term problem? Genetics – Unfortunately for some kids, it is in the genes, but that doesn’t mean that their isn’t potential for them to grow out of it. Diet – Processed foods, low fiber foods, mostly white bread products, and frequent consumption of the foods on the list to avoid below. Intolerance to dairy or wheat or both – An intolerance is different that an allergy and some kids may have difficulty digesting wheat or dairy, which slows down their elimination. Dairy is more likely and often moderating it and eliminating cow’s milk is a winning combination. Holding it in – Some kids actually hold it in because they don’t like how the poop feels coming out or they had a previously painful movement. This can snowball quickly and the longer the they hold it the worse it becomes. I’ll talk about this more in the next section. Poor Chewing/Picky Eating – If you child doesn’t chew their food well or has difficulty chewing and swallows large pieces of food it could contribute to constipation. Of course, picky eating with a diet limited in fruits and veggies can also lead to constipation. Keep in mind that if constipation is the underlying problem it can cause picky eating. 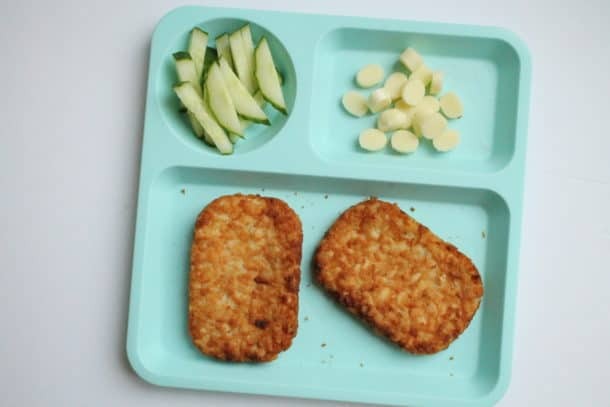 If a child is backed up then there isn’t a lot of room to get more food in and they will often refuse to eat, which needs to be respected because eating could cause them more discomfort. Poor Water Intake – I think this often goes unnoticed and is often a piece of the puzzle with my son. He drinks water well, but in the winter months when he isn’t as thirsty I need to make sure I give him reminders. A low amount of water makes it difficult to move the poop through the intestines. Low Tone – Yes, that’s right our kids muscle tone can actually effect their ability to push poop out and if this is the cause too much fiber is a bad thing. Read more about low tone here. Affiliate links used below See our full disclosure. Timing – Sooooo many kids hold it when they have to go because they are somewhere they would rather not “go” or they don’t want to run in from outside or stop in the middle of playing. Missing those cues can have a huge impact on how constipated your kid gets. 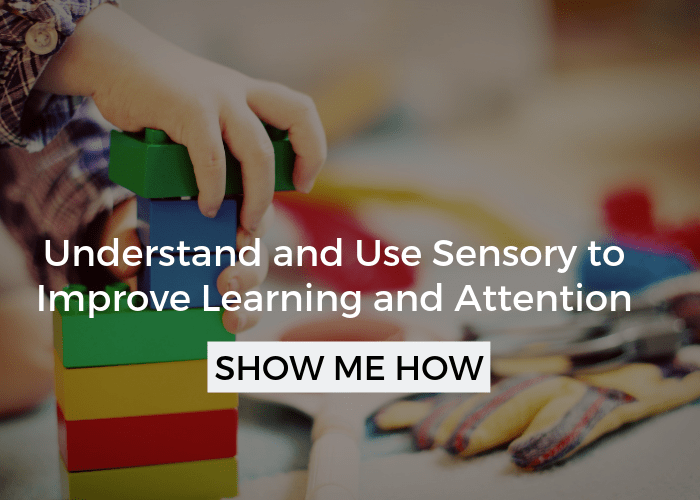 If you happen to be staring at your kid at that moment you might catch the signal and can rush them off anyways, but sometimes they hide it well and often we miss that quick moment. The solution is to have them sit on the toilet at the same time everyday or every other day. The best time is usually right after they eat. I try very hard not to turn toilet time into something negative or worse, a power struggle. I need to give Sam lots of warnings throughout the meal (“As soon as your done, go and pick out your book for the potty.”) and mornings usually work really well. When we are on top of this it is very helpful. Eating the “right” foods – This should be a huge part of your plan if your kid is constipated. I know some of these foods may be difficult to get into your child if they are a picky eater. 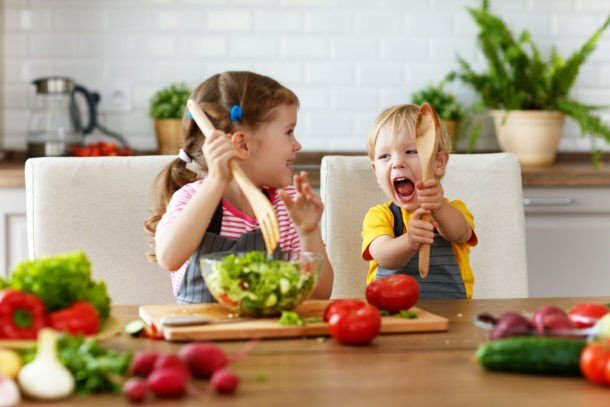 If that is a case, don’t try to lay down the law, slowly start to introduce these foods in fun and playful ways to get your kids interested. 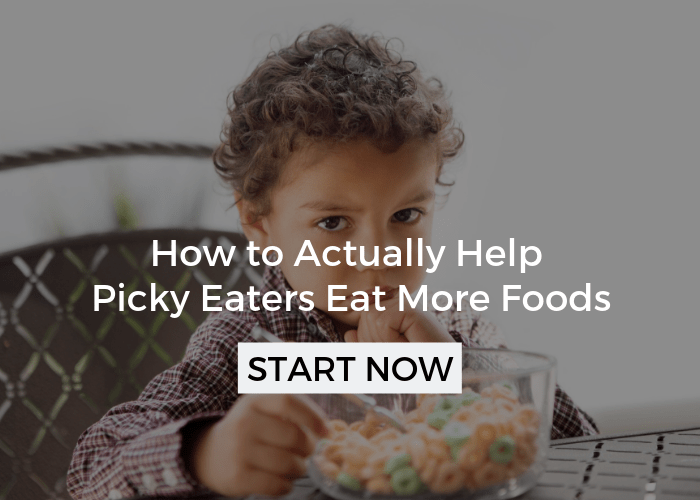 See the large volume of picky eater articles I have in the article index for more ideas! Check out this high fiber article from Greatist for even more ideas! Read the Label – All of the foods above are high in fiber, which helps relieve constipation. However, you can’t always assume that because something is whole grain, whole wheat, or brown rice that there is fiber. 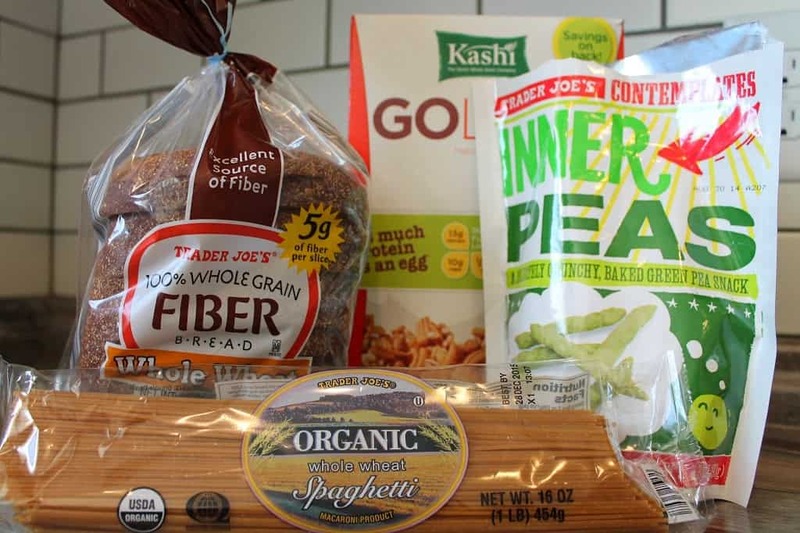 Also, there are a lot of high fiber products that don’t necessarily fit into those categories either, so it is really important to read the label. I would recommend trying to avoid buying foods that have anything less than 2 grams of fiber. That may sound overwhelming, but there are so many options now when it comes to breads, pretzels, crackers, etc. You will also want to try and maximize the fiber, don’t just stop at 2 grams. Keep flipping over boxes and bags until you find the highest number. Of course, the natural sources of fiber are superior because many of the high fiber products add processed fiber. For more high fiber ideas, head over to 13 Tasty High Fiber Foods That Kids Will Gobble Up. 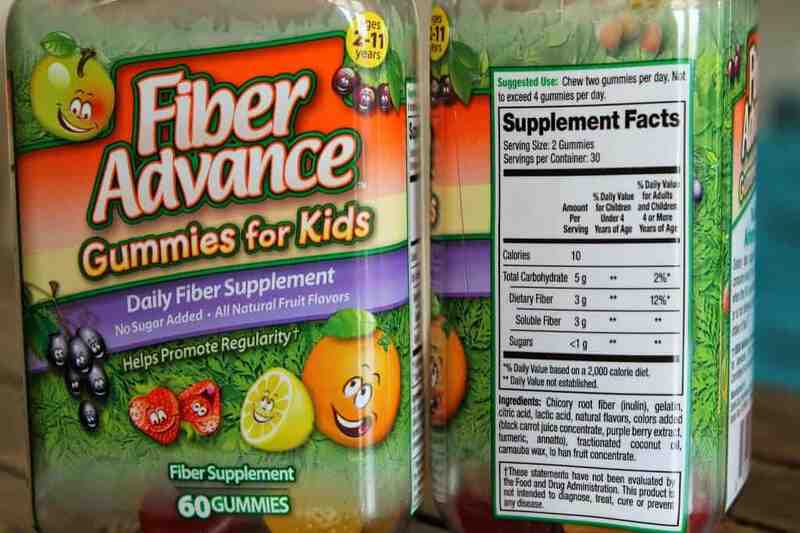 Natural Supplements – When we started to back off of Miralax I was happy to have found Fiber Advance Gummies For Kids , an all natural fiber gummy that I give to the kids. There are very few ingredients and no sugar. My kids love them. I want to try this product, Heather’s Tummy Fiber POUCH , a Facebook fan recommended it, but haven’t had the chance yet. It looks pretty awesome. Needless to say I wanted to share it here. *UPDATE* Several readers have shared other products that have been helpful. Again, I am not endorsing these products, but passing on information. Discuss any medications with your doctor. Water – As I mentioned above, get the water in! Have a cup ready to go at the start of your day and readily available all day long. Give gentle reminders as needed. Also, take water with you everywhere so they can drink in the car or running errands. Tummy Rub for Constipation – Get full directions for a “poop massage”, these stomach rubs can take just a few minutes and be highly effective. As a feeding therapist, I hate to tell kids there are foods they can’t or shouldn’t eat. At four years old, I did begin to explain to my son that these were foods we could only eat sometimes because they made it much harder for him to poop – can’t say I liked doing that, but he gets it. None of these things are totally off limits, but I do limit them as much as possible. We are still working at this ourselves and haven’t found a complete solution. We switched to almond milk for several months and still allowed some dairy, with a lot of moderation. The switch off of cow’s milk didn’t seem to make much of a difference so we have recently gone back to it. It is something I am constantly managing and monitoring. At this point we are still using Miralax on an as needed basis, which can be anywhere from 2-6 times per month. For us, that is a lot of progress from daily use. Ultimately my goal is to rarely need it. As I mentioned, this post isn’t exhaustive but mostly my personal and professional experience, and I thought it would be helpful to share here on Your Kid’s Table. If something is working in your house that I didn’t list here, PLEASE share so that it can help others, myself included! Magnesium citrate powder mixes well in water or other things and my son with DS is kept regular with a daily dose in whole milk plain ORGANIC yogurt with maple syrup. Remember to avoid grains/breads unless they are ORGANIC as almost all wheat barley and oats are harvested with glyphosate to bring the hybrid wheat to harvest at the same time. Glyphosate (Roundup- the reason for GMO plants) causes gut micro-perforations. If none of these tips work try manual remove their poop w your finger w vaseline they will go poop believe me my son still has constipation and he is 11 years old. .any single moms need help getting their toddler child or baby to go poop let me know I will help u . my ex fiancé is a pediatric nurse . Hi I’d just like to point out that from your description, your son likely has a protein allergy to dairy so simply “going off cows milk” is not going to help. If you try eliminating ALL dairy from his diet for 30 days you may find he has no need for Miramax again. No dairy doesn’t just mean no butter, milk, cheese, sour cream, cream cheese, yogurt etc. You will also find dairy in many processed foods and even seasonings. Just as a heads up. We are 100% dairy free since we found out that my daughter and I share this problem. (Also it isn’t a lactose intolerance so lactose free dairy will not help.) And no cooked dairy is not good either. Honestly there are so many delicious healthy alternatives such as coconut, almond, cashew, and macadamia nut products (to name a few) that you won’t miss dairy at all. There is dairy free yogurt and ice cream and it is all just as good with live cultures. Do be careful for things that say “non-dairy” as well. They usually have milk derivitaves. And as a reminder ghee is just clarified butter and so it is dairy. I’d try it for a month and if it helps it becomes an easy lifestyle. Eating out can be a challenge dairy is hidden everywhere from buttered buns on hamburgers to dairy in the eggs or sausage casings. Otherwise it is a breeze if you cook yourself. I am Nanny to my maternal twin 4-year-old Granddaughters, so I basically have had the great joy of raising them. They were born 5 weeks premature and lost weight after they were born due to an incomplete colon. Needless to say, they both have IBS issues and one, in particular, holds it in. She has numerously ripped the delicate tissue when she does poop and it will usually be a huge round ball. (Poor baby). She has been on a regimen of Miralax for at least a year. It just isn’t working. I have limited her dairy (actually both of the girls’) but it doesn’t seem to make a difference, however since they are picky eaters and Mac and Cheese is their favorite and possibly the worst to eat, I only use organic whole wheat noodles and here is the trick, I cook carrots and blend them into a sauce (mirepoix) of whole wheat flour, lactose free milk, and real butter. I add to that a slice of Trader Joe’s cheese soy slices). Another sauce to use for Mac and Cheese is a spoonful of concentrated Cream of Chicken soup (no milk added). But still trying to figure a way out of using Miralax which has been prescribed by their doctor. My 6.5 year old son refuses to sit on the toilet, and he only goes in his underpants or a diaper at night. When I try to get him to sit on the toilet, he just shouts a decisive ‘no, I don’t want to!’ and there is just no way to convince him. During the day, he poops small pebbles or very liquid, but only does a real ‘movement’ if he’s wearing a diaper and in bed early morning. This is stopping him from many social activities and he is obviously distressed by his problem. I’ve tried doctors, psychologists, homeopathy, osteopathy, massage, laxatives, diet change, bribery, nothing, everything! Tomorrow we’re seeing an aromatherapist, fingers crossed he’ll be going to the toilet at some point this summer..! I give my daughter Hemp Oil (about 1/4-1/2 tea) several times through out the day. I put it in her milk (which is almond), cereal, juice…wherever you can get it in. Make sure it’s well mixed as it’s not the best tasting. If I notice her poops are hard, I up the dose a little. If poops are soft, I cut back a bit. It takes about 4 days to start working. My daughter is 5, has a horrible diet (doesn’t eat many fiberous foods) and has never been constipated. Poops like a champ 1-2 times a day with 0 issues. Every person i’ve told about it has had amazing results. Which hemp oil do you use and where do you buy it from? Thank you so much for this post. My nearly 6yo has been through most of what you described and over the years we also tried most of what was adviced here, incl removing milk and gluten from his diet etc etc, and yet got desperate enough to very reluctantly reach for prescribtion cosmocol (our uk equivalent sachets). I applied some of the various good advice shared here, but for us amazingly, what seems like possibly a long term solution, was found in something as simple as watching the youtube video called ‚The Poo in You’, together with our son. In fact, he watched it several times, understood why the soiling/overflow occurs, with the help of a couple of paediatric cosmocol cleared the worst out of the way, and then began to make a conscious effort to try and use the toilet after every meal, to prevent build up, sitting correctly etc. He now knows that withholding is not his friend, and that each day missed makes matters worse. We had one or two hickups, but other than that, he has been to toilet every single day for the past three months and says it is no longer difficult or painful as before at all. He now uses the toilet without even calling me too. I think this is our definite breakthrough, and he went back to enjoying milk (mostly the real raw milk though) and bread/other gluten, and still no issues this far. I do intend to get all my children regular probiotics. Wishing other parents success too. There definitely is a hope. Please try pegalax or Jaslax ofcourse with doctors consultation. My kid was 4 years old and I was begging everyone to help me ,just could not see my kid in so much pain and struggling everyday pain. found pegalax, started daily basis as recommended and then within few months (as my kid was in this state for a quite few months by then) , I needed no medicine , no worries no dependency on any thing..normal routine..
but I still watch that I give proper water and fiber in diet. Thank you, my son is doing great! Over a year ago we started using juice plus (it’s a fruit and veggie gummy). I now distribute it, you can find it at alishagrogan.juiceplus.com if you’re interested. Yogurt is an everyday accessible nutritious food at every home. But, can it be given during the cold winter months considering yogurt is considered a ‘cold’ food in itself. Very good blog. Great information on here. Constipation is unhealthy and can cause other ills. The child feels bad when constipated and with holding. Causes tummy aches, head aches. A constipated child who does not have regular daily BM s will be sicker and recover from illness slower. Not a doctor or medical person here. Strictly my opinion only. No giving medical advice. Consult with your pedi or naturopathic doctor before giving any remedies. As stated above there seems to be more children constipated and having tummy aches than years ago. I do not know why this is. Possibly some one can state the reason for this. I hate giving miralax to mine. Prefer natural home remedies. Do not like giving meds, chemicals, harsh laxatives and such. My 5 yo with holds. It is a constant struggle to monitor him and have him go. Not with hold. Which causes so many problems. I do, or tried, many of the things listed on here to have him go. A older mom, who is a older retired nurse, told me he would benefit from being given enemas. I did research on Soiling Solutions. Enemas are part of the program. As well as “sitting”. “power hour” etc. I could not afford the book from the program by Dr Collins? (think that is the doctor). Another mom is dong the program with hers. She let me read the book. We discussed enemas. He is given enemas. They have helped. Actually better than miralax. Horrible stuff that is. The first ever enema may be difficult. But later enemas are easy to give. My 13 year old has been on miralax since 5 . It has caused my child all kinds of neurological problems including temporary loss of the use of her legs and arms . Her body overheats and we have to keep her cool at all times. Miralax isn’t approved for kids even though our doctor put her on this , so please think twice before giving this to your child over a long period of time. It has some of the same ingredients as antifreeze and you know what that does to animals. The FDA has over 25000 complaints for this hurting kids and killing over 100 of them! Hmm that’s interesting Rebekah, I haven’t considered that. Thank you! Some time Constipation in Kids can make your kids unhealthy and may result in bad growth. But thankfully this blog post is giving some useful information regarding protection and other information. Thanks for sharing this post. I am glad to see I wasn’t the only one to question Miralax everyday recommendation from my daughter’s doctor. She is almost 11 now and we have solved the potty problem with Apple Prune juice. She enjoys the taste and we only have to use it once or twice a month. That’s perfect! Research has actually been starting to come out with long term miralax side effects! You can be certain it will Lauren! This is so helpful and is another valuable perspective in helping the rest of us piece together the constipation puzzle! Thank you!!! Oh man – I wish I would have seen this a year ago! My guy is about to turn 4 and we are still using miralax several times a week and still having potty training problems. We did figure out the dairy component about six months ago, and that made a huge difference for us. We have also found popcorn to be a great source of fiber that both my boys love! Thank you so much for sharing your story – at least it is so nice to know we are not alone, and it’s great to have a few more ideas to try! You might need a stool softener, not a laxative. I had oral surgery and was prescribed amoxicillin (antibiotic) and endocet (pain reliever containing acetaminophen and oxycodone). In the patient prescription information for endocet it lists constipation as a possible side effect, and goes on to say “To prevent constipation, eat a diet adequate in fiber, drink plenty of water, and exercise.” I had not had side effects from medication before that I can remember, and unfortunately, I did not read all of this prior to using this medication. After the surgery I became severely constipated. I had not eaten anything for several days, so when my bowl movements stopped I did not notice. Rarely in my life have I been constipated. Once I started eating again, I became uncomfortable within a few days and realized that I was constipated. I tried prune juice, laxatives such as Ex-Lax, Phillips Milk of Magnesia, SenokotXtra, and a self-administered rectal suppository. Nothing worked. Days were going by and I was becoming extremely uncomfortable and was very close to going to the emergency room for a rectal water enema. I decided to call my doctor (general practitioner) first to ask his advice, but he was on vacation so I spoke to another doctor in the office. I related the story above. Although I was seeking advice on what over the counter medication I should take, I was advised instead to go to the emergency room and have an x-ray because I might have a tumor. Of course, I thought that was ridiculous. I did not suddenly develop a tumor. Although I had not read it, it seemed to me my problem was the result of taking pills for several days while not eating much of anything. Then I called a pharmacist, who then recommended medications that I had already taken. No new ideas there either. Finally I called the oral surgeon who operated on me. This seemed at the time to be an odd question for him, but I was getting desperate. He immediately said I needed a stool softener and recommended Colace. He said such problems were common in hospitals and this is what patients were often given. I bought it, took it, went for a long walk around the neighborhood and periodically walked around the perimeter of the backyard for 15 minutes at a time, and in 12-18 hours began to have relief. The stool came out in hard compact clay-like nuggets. It was difficult and a bit painful to pass and I squatted in the shower to do it, but once the process started I experienced relief in increments over the next 12 hours. My goodness. What an ordeal. Glad you were able to find advice that worked and will look into stool softener for my child. My son too has constipation problems and I have been using Miralax to help him out too. Be careful using that stuff it is poison. I will NOT use miralax anymore. 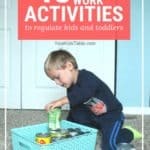 I appreciate your blog..it has given me new ideas to try for my son. Thanks so much everyone for all the amazing tips and advice you are sharing. That is exactly what I was hoping for! I can tell you that the more my kids drink a lot of water the better off they are! My daughter has struggled with this since she was just over a year old. she would have tears everyone she had a bowel movement from the pain. she still eats dairy products, but I switched her to almond milk. There is also a great juice called “plum smart”that works wonders! It is good tasting prune juice that she willing asks for. Might be something others want to look into as well! My third child is a holder and it upsets the entire family because she night wakes in pain 🙁 She is almost 2 and is still nursing. If we give her a “pooper” (enema) she can hold it still until the next day. Sometimes she even vomits when she tries to poop. It’s really awful. She doesn’t get much dairy except yobaby (with probotics). I would really like to be done nursing so I plan to switch to the Silk until we get this figured out. She doesn’t seem to be allergic to anything and she’s overall pretty happy. I just think she hates to poop. We tried miralax and she started throwing up. I hope this helps!! Poor Babies!! My 6 year old has chronic constipation (since at least age 2). She struggled with daytime wetting (and had daily BMs – but her insides were full of stool pushing on her bladder). I wanted to add that too much fiber can also be constipating when not balanced with liquid. Daily fiber should be the child’s age + 5g with minimum fluid being total fiber x 3oz. (For example my 6 year old needs 11g of fiber at at least 33oz fluid daily.) If she eats more fiber than that she needs to drink more water, etc. this info is from our GI clinic. All the best you all the moms & kiddos dealing with this! Thank you so much for that very helpful comment Cathryn. I haven’t heard that before but it makes a lot of sense and I will be figuring out the calculation for my kids! I’m a PNP and I second absolutely everything you said in this post!! My recommendation usually is for a big initial clean out with miralax, then starting to do the dietary stuff along with fiber and probiotic supplements (I like florajen and culturelle) but like you said one of the most important things is to have a scheduled bathroom time. I like your idea of reading books but one thing I have found very helpful is blowing balloons!!!! Sounds crazy. But of course it forces them to valsalva without even knowing they’re doing it. Works like a charm and makes bathroom time fun. Give it a try sometime!! Thanks for sharing your tips. I often send my mommy friends to your blog. 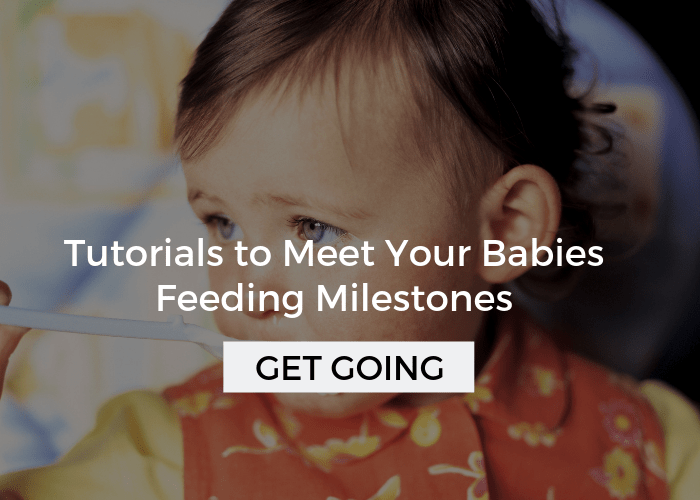 You’re one of the few mommy blogs I feel like I can trust to give evidence-based advice! Thank you so much for the helpful comment. I will be trying the balloon! Great post, i have a two kids which of one get often constipation problems. Thanks for sharing this informative post i would be following this tips. I have a daughter and she has had the abdominal pain off and on for about a year now. We’ve been in and out of her doctor’s clinic. The doctor ordered for an x-ray then said it’s just poop while I know for a fact that my daughter is not constipated because she regularly moves her bowel. We’ve also done ultrasound, stool test, etc. All tests came clean. But she is still in pain. I’m sorry Brandy, that is so frustrating. Sometimes you have to keep going to different docs until someone finds a solution. It might be helpful to try a natropathic dr- they look at problems through a different lens. Good Luck! If a child is pooping that doesn’t mean they are not constipated or blocked further up. My daughter was pooping every day, but it’s the type of poop that makes the difference (ie hard pebbles, softer stools). Also they can be impacted further up but some can get through to give a regular poop. If the dr saw poop in the xray then it is most likely there. They also should have followed it up, because impaction is very painful for kids and can cause problems. I know as my 2 have had them. My youngest has been on a stool softener for 12 months. When constipated the bowel stretches. Once going regularly, with the correct poop consistency they need to stay on the stool softener for twice the length of time they were constipated; as it takes the bowels this long to go back into shape. I know this as my childrens bowel issues are hereditary and have been extensively researched by paediatricians, gastroenterologists and other specialists. Impaction can also mimic signs of recurrent UTI’s as the bowel compresses the bladder; causing frequent urination, pain when weeing etc. I would go to another gp, get an xray and if there is still too much build up then ask them to follow it up ASAP. Good Luck. Check for chronic appendicitis! I had abdominal pain for almos 1 year, several visits to the ER, c-scans, MRI, endoscopy/colonoscopy all my tests came back fine! Last month, the pain was intolerable called my GI doctor e told me to go to the ER, and he would meet me there he called a surgeon. They did a exploratory surgery in my abdomen, removed my appendix and I’m fine!!! Finally!!! Most doctors don’t believe in “chronic appendicitis”, you should mention that to you’re daughters Gi doctor. Good luck! Oh no. Watching a child experiencing pain and not being able to help or fix it is just awful. As a little kid I had major issues with my digestive tract. I fear my 1yr old will develop the same issues. I know this is old but if they seen that she was full of poop on the xray then they must have seen poop. If you told the doc she goes regularly then he should have taken the time to figure out why it appeared she was backed up. Maybe she had a small blockage allowing her to still have BM. I had several xrays taken for my pain as a child with all of them saying i was “full of crap” i am curious what happened in your daughters case. 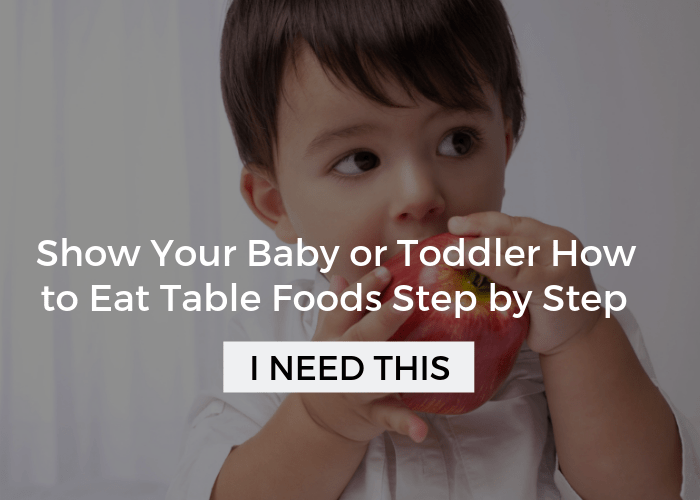 My daughter (now nearly 4) started having issues with constipation when I began introducing solids. It didn’t matter what she ate, she was constantly constipated. I don’t know if she was holding it in (at ~1 year old?) or what, but I tried everything. Asked my doctor for help, and he told us to use PEG. It just gave her a massive diaper rash and diarrhea. Finally I brought her to my chiropractor, and he found that her spine was out of alignment down where it is connected to nerves in the intestines. He also suggested aloe vera juice. There was not an immediate change, but after several visits she was pooping regularly and not long after we ditched the aloe entirely. She still goes regularly for wellness visits, but hasn’t had problems since. She can eat tons of cheese and bread and is still fine. I literally credit my chiropractor with saving her life, because otherwise I have no idea how she would have been able to eat properly. Thanks Anje! That is a really helpful idea, that I’m going to have to consider! Alisha, I really appreciate this post! My son is also 4.5 and he has been dealing with constipation issues since he was about 10 months old. Though we try to maintain a diet mostly of whole grains, fruits, and veggies, we often fall short and are inconsistent. He is completely dependent on Miralax once, sometimes more a day. We’ve had him tested for food sensitivities, celiac disease, Hirschprungs disease and more, of which he has none. When he turned four it finally dawned on me that he could be withholding much more that we have been aware of. We are still working with him to sit on the toilet. He gets backed up and its as if he simply can’t hold it in any longer and then it comes out, often without his control, so it seems. He has a lot of accidents and I think he gets frustrated. Sometimes he insists on wearing a diaper still. He is suppose to start Kindergarten in the fall, but I get really discouraged that he may not be able to participate for 3.5 hours a day, 5 days a week. Anyway, thanks for your post! I’m definitely going to try having him go after breakfast every morning. Thanks for the fiber supplement recommendations too. I look forward to hearing more about your journey. Hi Brittany, thank you so much for that comment, I really appreciate it. Our stories are so similar, I just added a few more products that were recommended by other readers, you will see the bold UPDATE above, if you are interested. Sitting him on the toilet regularly was a huge success for us, although we admittedly don’t always follow through. I have ordered the tummy fiber and am really hoping for success with that- I will update that too! The accidents have been an issue here to and I think that is where the miralax doesn’t allow them to hold it anymore. Best of luck to you to, I hope some of these strategies are helpful!